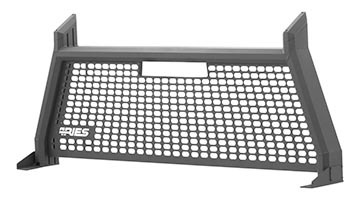 The ARIES AdvantEDGE™ headache rack is designed with today's pickup truck in mind. Unlike the more common round and square tube frames of most headache racks, it is built with an octagonal tube profile. It features an angular frame of extruded 5.5" eight-sided tubing, welded together for a modern look. 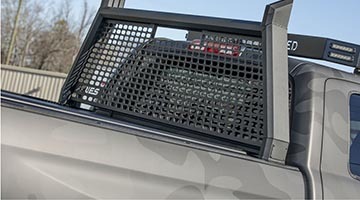 The center section is a stamped octagonal grid that not only provides extra protection for the rear window of the cab but also adds a distinct look. To truly set the AdvantEDGE™ headache rack apart, we construct it entirely from aluminum alloy. This supplies the headache rack with strength, while remaining lightweight to complement the fuel-efficiency of today's pickups. Aluminum also allows the AdvantEDGE™ headache rack to be completely impervious to moisture, rust and the outdoor elements. Unique Design - The angular, eight-sided tube profile and octagonal grid center section offer a fresh look to complement the style of today's pickups. All Aluminum Build - The aluminum alloy construction is strong, lightweight, rust-free and has no plastic parts, meaning it will never crack or fade. 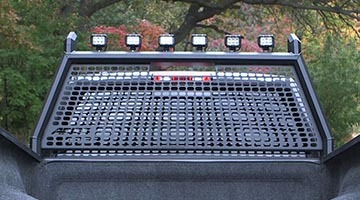 Customizable Top Rack - The upper cross-member features a versatile track system to accept LED light bars, off-road lights, tie-down anchors or other accessories.